Hand Rejuvenation treatments are here! Our Salt Lake City, Highland, Draper and Orem medical spas are helping restore volume and improve texture in the hands of women of all ages. “If you want to really know a woman’s age, look at her hands” This popular saying is very true as the hands are often one of the first body parts that show the signs of aging. The hands can’t escape exposure and are visible in almost everything we do in daily life. Sadly, the hands are often neglected, with patients instead focusing their anti-aging efforts on their face. If we could go back in time and tell our 18 year old selves to apply sunscreen to our hands all day – every day we would, even though we doubt we’d listen at that age! The aging of the hands is characterized by a loss of tissue volume and elasticity of the skin. This increases the visibility of tendons, veins, and bones on the back of the hand. Years of exposure to UV rays and other free radicals cause the skin on the hands to appear spotted, dull, wrinkled, and/or crepey/papery. Want to look down at your hands and not instantly be reminded of your age? Check out our Hand Rejuvenation treatments! What is a Utah Hand Rejuvenation Treatment? You’ve heard of filler in the face right? 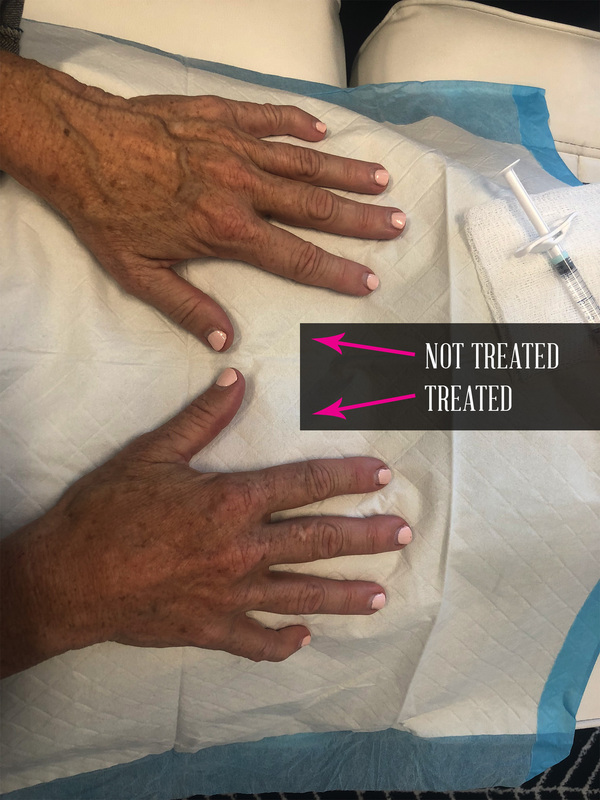 (Lips, cheeks, etc) Well, our Utah Hand Rejuvenation treatments is basically the same thing… filler injected into the hands! Filler restores volume to areas where it is needed and reduces the appearance of veins and tendons. We also offer IPL Photofacials and chemical peel treatments to help with any discoloration or age spots. Décolletage and Neck – Another prominent tell-tale aging location that gets neglected. Interested in other ways to look younger? Take a good look at your neck and chest (aka – décolletage). As we age, the skin in these areas begins to show dramatic signs of wear and tear. Age spots, sagging and wrinkled skin are bound to happen on your neck and chest as they’re commonly exposed to the sun and frequently come second to adequate protection in our younger years. Come see us! Spa Trouvé in Draper, Orem, Highland and Salt Lake City has multiple treatments to help with improving the skin appearance on your neck and chest. Depending on what is ailing you the most, whether it’s sagging skin or age spots, we’ve got a treatment that can dramatically improve the texture or color of your skin. From IPL photofacials to PDO thread lifts, our expert estheticians will help you find a solution to restore a youthful appearance in these areas. Spa Trouvé is here to help you turn back the hands of time and restore a youthful appearance. Whether you’re looking to restore volume to your face or hands, banish wrinkles, or looking for sexual health information, we’ve got you covered! 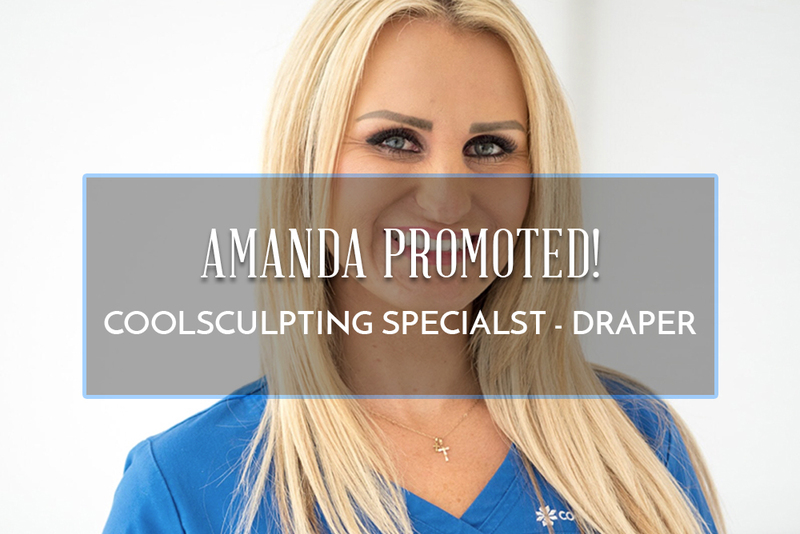 CoolSculpting Specialist in Draper – Amanda!